Before you go and get all gushy and approbational on me, know I didn’t come up with this idea. 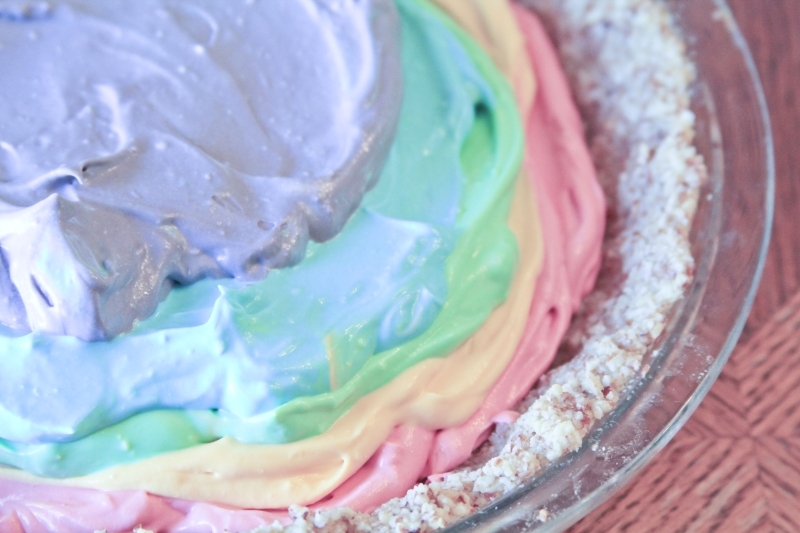 The beautiful Richard Simmons dessert of unicorn happiness props go to this clever guy over at tablespoon.com. I just made the recipe a little more simple for families and more low-carb, naturally. Tip: If you don’t want to use red food coloring, try beet or raspberry juice for the red layer. I even brought some magic with a new crust that I really enjoyed making for the Peanut Butter Cookie Pizza this weekend. Tip: Substitute 1/4 cup heavy white cream in place of the buttermilk + water to save carbs. This recipe is gluten-free, sugar-free, low-carb, and 5 carbs per serving if you cut into 10 slices as we did. Mix ingredients. Form into a ball. Flatten into a patty in clear plastic wrap and refrigerate for 30 minutes. Press into a 9-10″ pie pan. Bake for 10 minutes at 375 degrees Fahrenheit. Let cool completely. This is what the crust looks like post the first baking. Combine the cheesecake filling ingredients in a mixing bowl and mix until well blended. It’s like Easter. Only it’s not. But it could be. 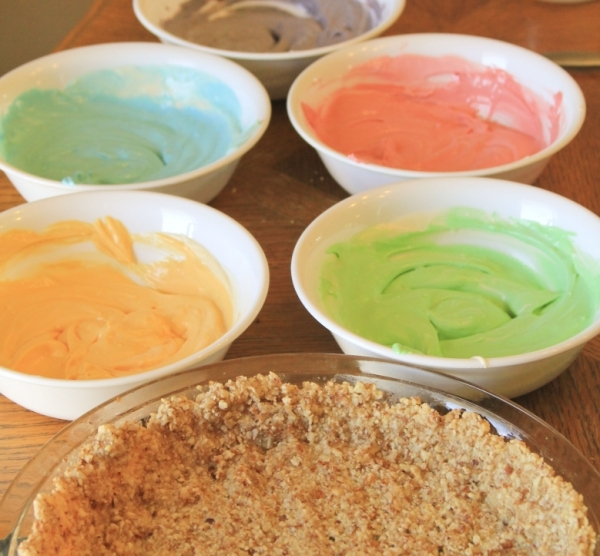 Start by spreading out the red mixture into the cooled crust. Add the orange mixture to the center of the red and spread out only slightly. 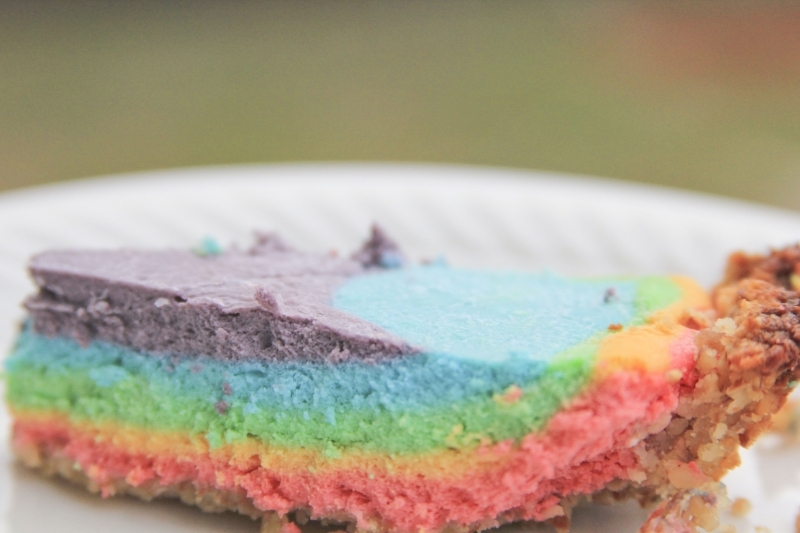 Don’t worry about spreading to the edges, because the cake will automatically do that while baking (plus, you don’t want to accidentally mix the colors). Add the green layer next in a slightly more tight circle, still in the center. Add the blue in the center, and then the purple, again, spreading only very slightly. 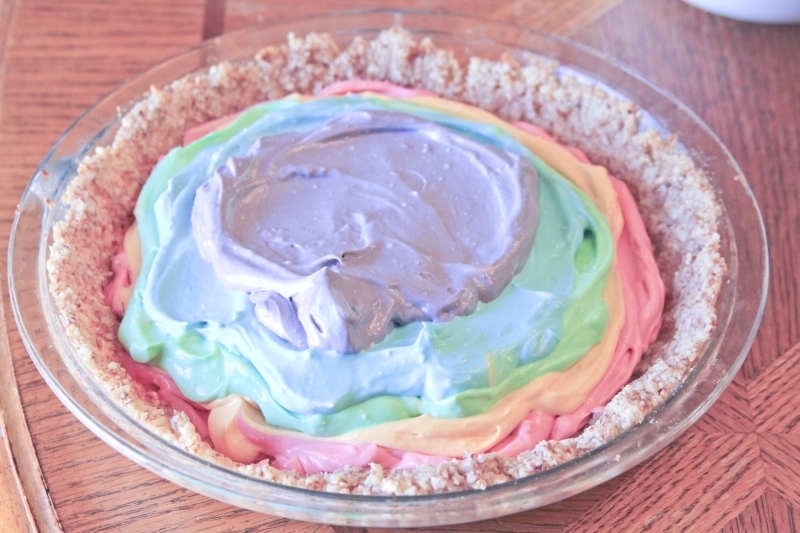 See the image for what mine ended up looking like before baking. 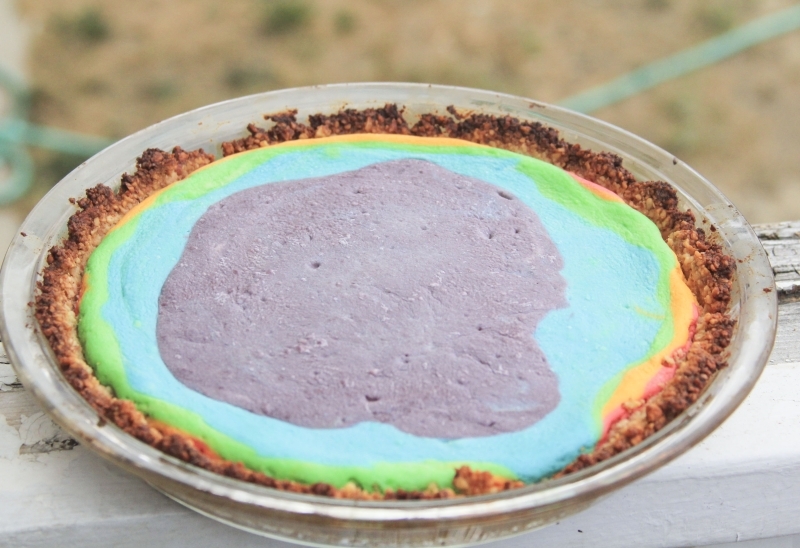 This doesn’t look like it’s going to bake into a flat cheesecake, but it will. Let cool for at least two hours in the refrigerator. Personally, the longer, the better (up to 24 hours). Slice and serve. Refrigerate remaining. Ta da! Didn’t I tell you? 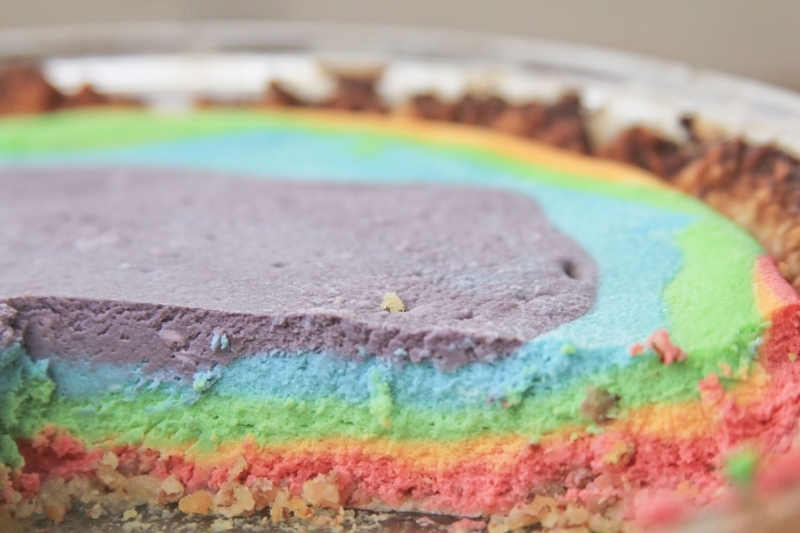 Flat, beautiful, fun cheesecake. Nutritional information per 1/8 cake: Calories: 485, Carbohydrates: 8.8 g, Fiber: 2.6 g, Net Carbohydrates: 6.2 g, Protein: 11.5 g, Fat: 46.5 g.
Nutritional information per 1/10 cake: Calories: 388, Carbohydrates: 7 g, Fiber: 2g, Net Carbohydrates: 5 g, Protein: 9.2 g, Fat: 37.2 g.
Another close-up prior to baking because it’s so pretty. Unicorns and glitter! Looks good Jamie!! 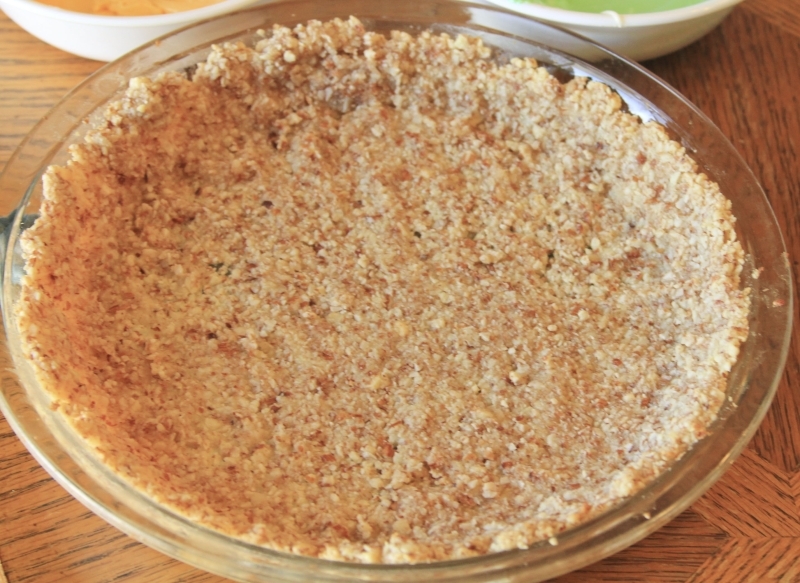 Have you ever tried making the crust with water instead of buttermilk (per your tip)? If so, was the taste or texture noticeably different? (Love your recipes) Hope you’re feeling better. Hi, Mary! Not yet, no. I stuck with the buttermilk this time out of ease. You could skip the buttermilk and use a little heavy cream instead. Great idea on the heavy cream. Maybe I could add a little vinegar. Thanks. Ermagerd! I love vinegar in just about anything. It’s like the liquid bacon equivalent for baked goods. looks so good-would b great for easter —but in the heck could wait that long to try it—cheesecake is one of my favorites—i could eat it everyday=hope u r feeling much better by now-couldnt live without your recipes -u and the recipes r the greatest. Thank you! It is super cool to look at. I’m not going to lie; it looks a little like Play Dough, so I think Play Dough when I look at it. Tee hee. who’d a thunk? That is so pretty and what child (or adult!) would not love this?!!!! Thanks for sharing! Perfect party food. Thank you! When I saw it, I had to at least try it. I was in the mood for rainbows.